The Grand Teton National Park, 310,000 acres in size, is located just 10 miles south of Yellowstone within the State of Wyoming. It encompasses the Teton mountain range, glacial lakes, the 15-mile long Jackson Lake, the upper stem of the Snake River and part of the Jackson Hole Valley. This is the second part of the National Park series following a post on “Yellowstone- The Landscape”. It really is astonishing to travel only 10 miles (16 km) south from the geothermal landscapes of Yellowstone to the majestic, and more serene, landscapes of the Tetons. The Teton mountain range is a sub-range of the Rocky Mountains that extends for 3,000 miles (4,800 km) from British Columbia to New Mexico. It is the youngest mountain range within the Rocky Mountains that began forming between 6 and 9 million years ago. 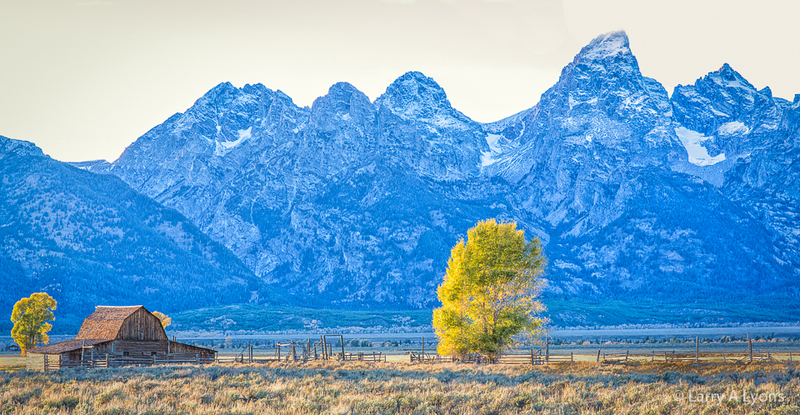 Mount Grand Teton is the tallest mountain within the Teton mountain range with an elevation of 13,775 ft. (4,200 m). Here Mt. 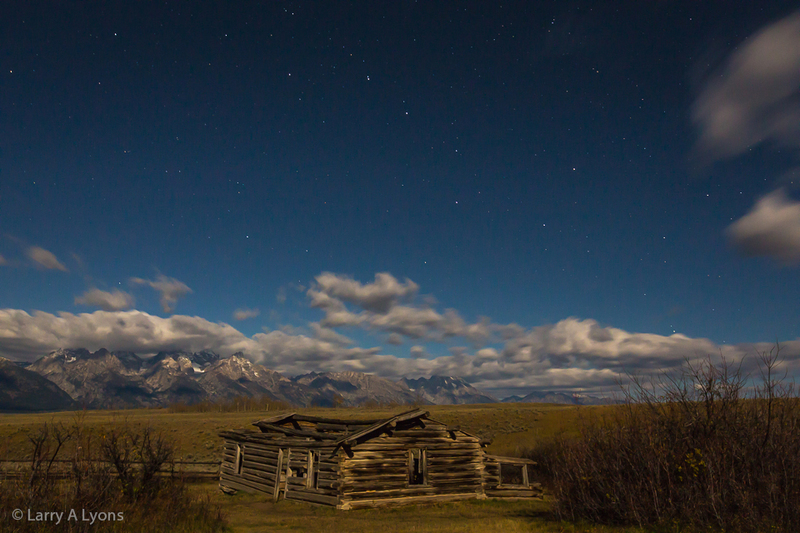 Grand Teton stands 7,000 ft. (2,100 m) above a Moulton homestead within Jackson Hole Valley. 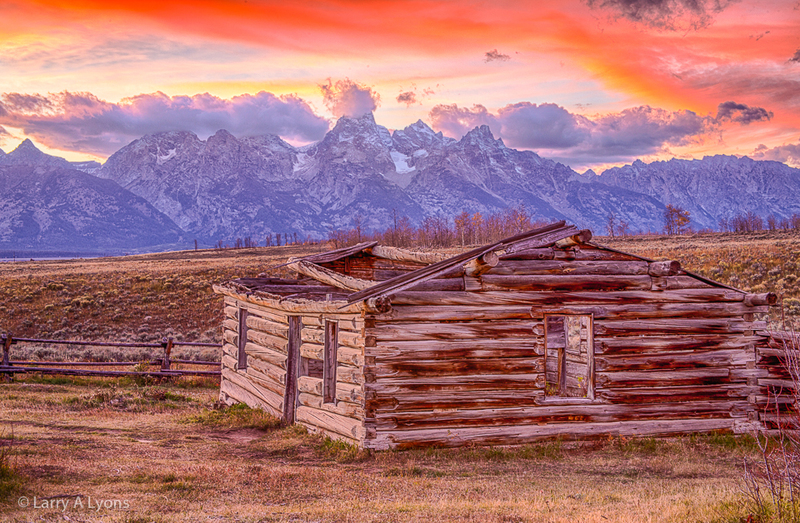 The beauty of the Tetons is never far from your view while visiting this national park. You just have to face west. 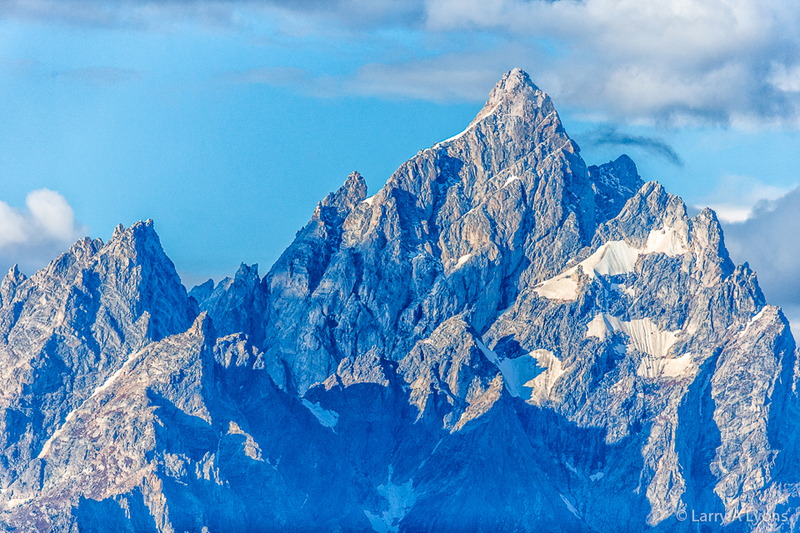 In addition to Mount Grand Teton, there are another nine mountain peaks at elevations over 12,000 ft. (3,700 m). Mount Moran, named after Thomas Moran, a frontier landscape artist, stands at 12,605 ft. (3,840 m). 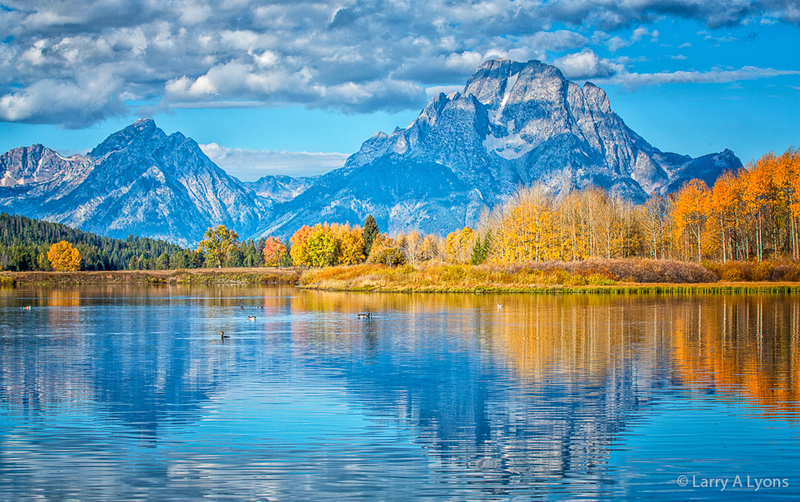 Mount Moran rises 6,000 ft. (1,800 m) above the Snake River at an area called Oxbow Bend. 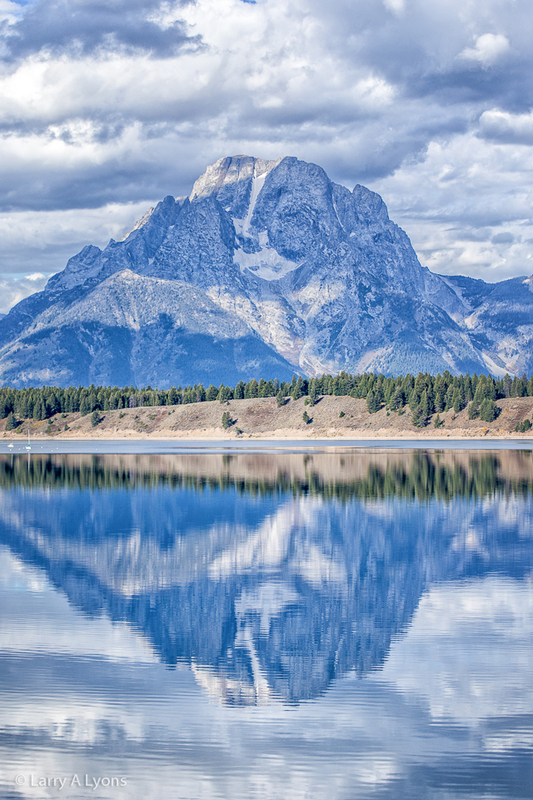 Here Mount Moran is reflecting in Jackson Lake. The major peaks of the Teton mountain range were carved out into their current shapes by glaciers that have vanished long ago. Small glaciers that continue to recede still exist at the highest peaks. 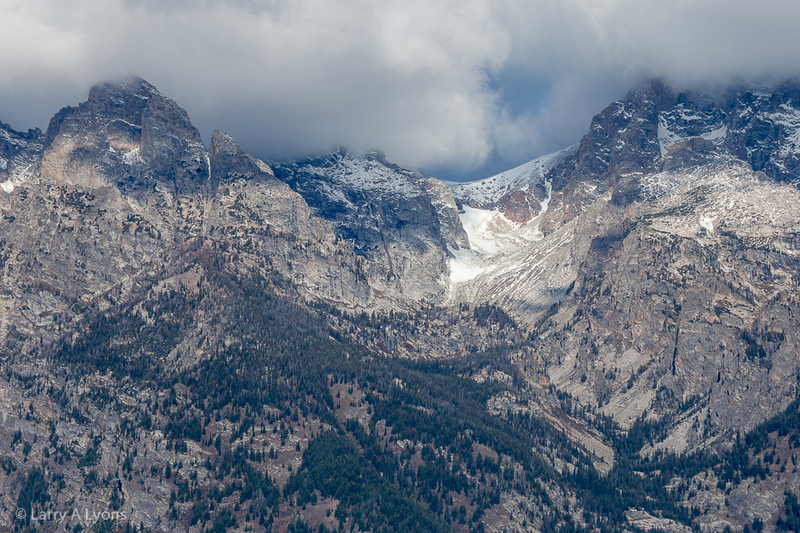 The peaks with their light blue glaciers and bare granite are often viewed through the clouds. Jackson Hole Valley within the national park is 55 miles (89 km) long and 6 to 13 miles (10 to 21 km) wide. It is a fairly flat terrain at an average elevation of 6,800 ft. (2,100 m). The Snake River starts out as a small river flowing west and south into Jackson Lake. The first 50 miles (80 km) of Snake River runs through Jackson Hole Valley. In the early 1800’s mountain men came to Jackson Hole Valley to trap for beaver and hunt for other fur bearing animals. Fur trading businesses thrived until about 1840 when businesses folded as a result of the decline of beaver populations from over-trapping. Today, beavers are back in business and building rather extensive dams. Weather conditions can really change how your images will be portrayed. The overcast days and extensive cloud cover when photographing within the park this past autumn really provided for some dramatic images. 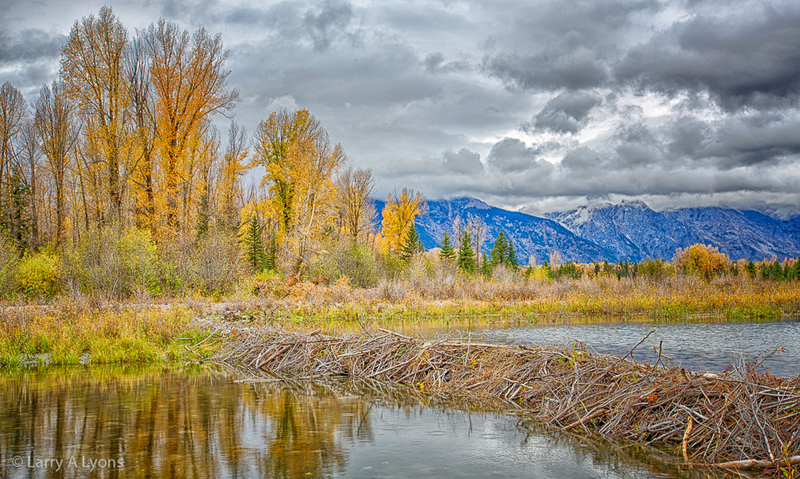 Here only the foothills of the Tetons were visible because of the extensive cloud cover when photographing the large beaver dam. 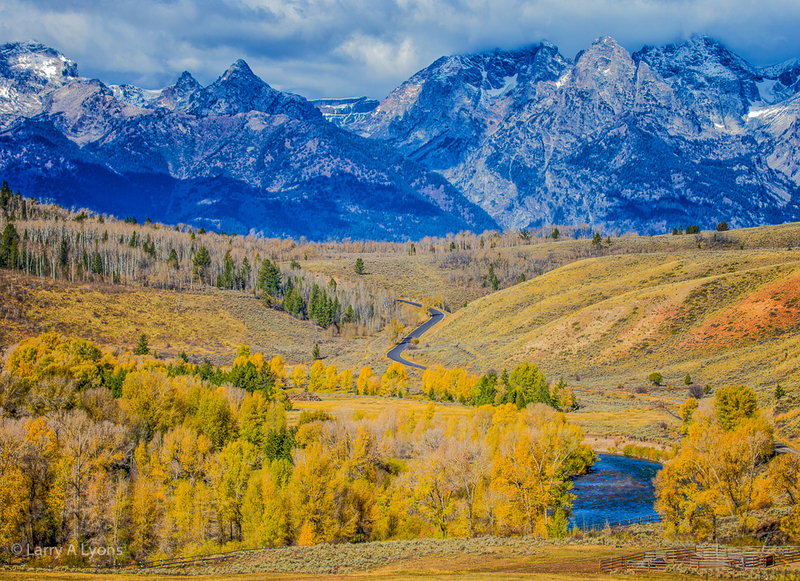 Jackson Hole Valley is also the home of the National Elk Refuge with the largest elk herd on earth. And Bison also roam free in the valley. Here the bison were moving in one direction, whispery faint clouds passing in the opposite direction in front of the Tetons, and the sun was beginning to set that lit-up the peaks and clouds. 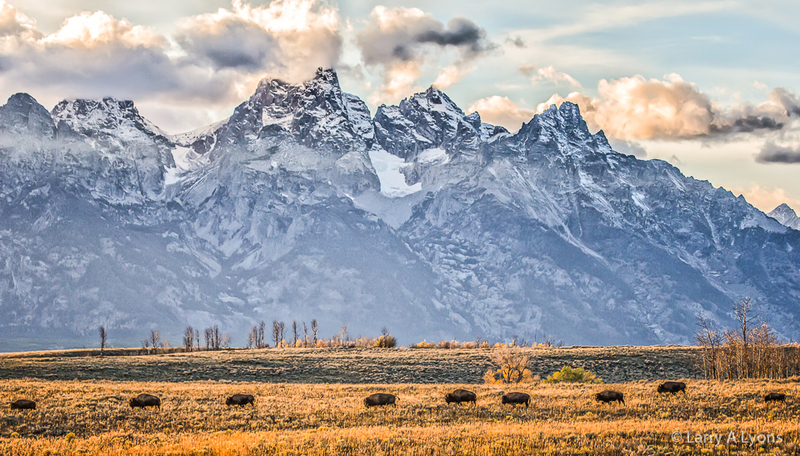 Like Yellowstone, the Grand Teton National Park supports a wide diversity of wildlife. An upcoming post will provide a glimpse into the wildlife that utilize and reside in the ‘Greater Yellowstone’ ecosystem encompassing both the Grand Teton and Yellowstone National Parks. 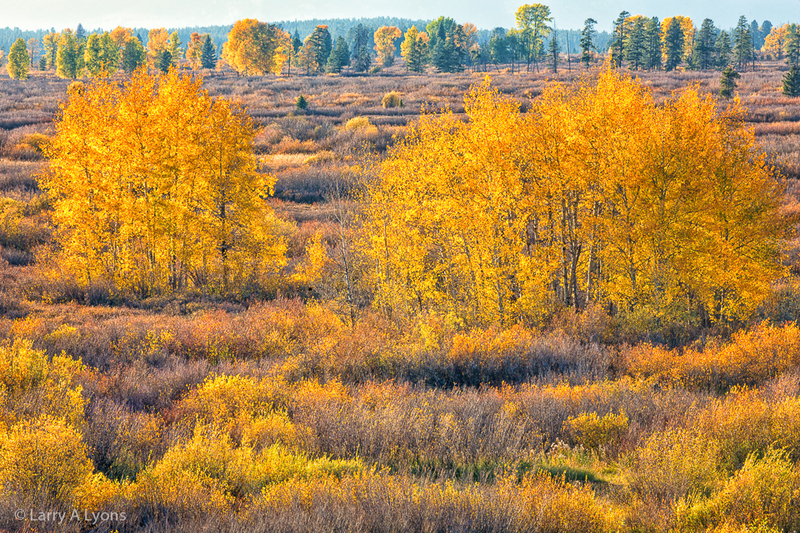 All of the images in this post were captured in the autumn when the aspen trees brighten up the landscape with their quivering, yellow foliage. 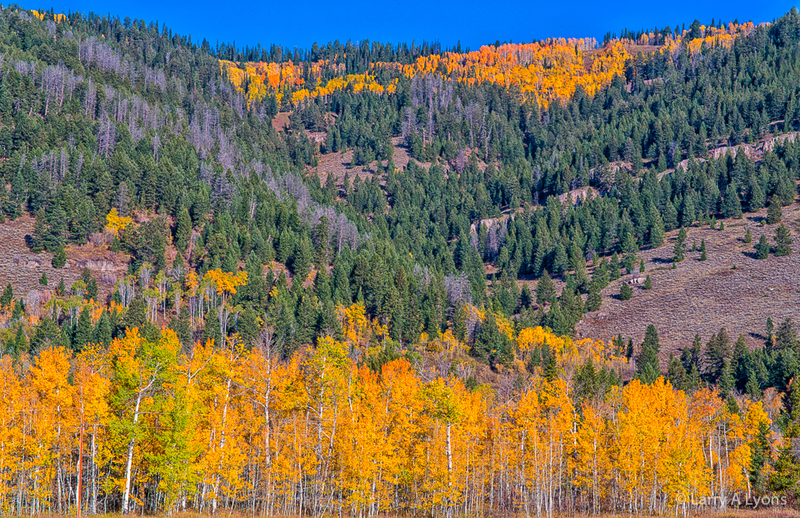 Autumn is a particularly good time to visit this national park. The green tint of the bark of aspen trees is created by chlorophyll that allows photosynthesis, providing energy from the sun for their growth. 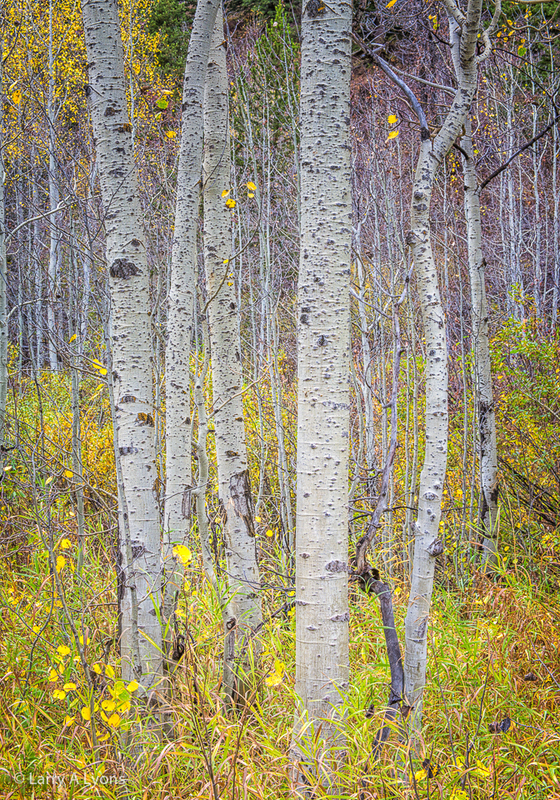 This allows aspen trees to flourish during their short growing season. 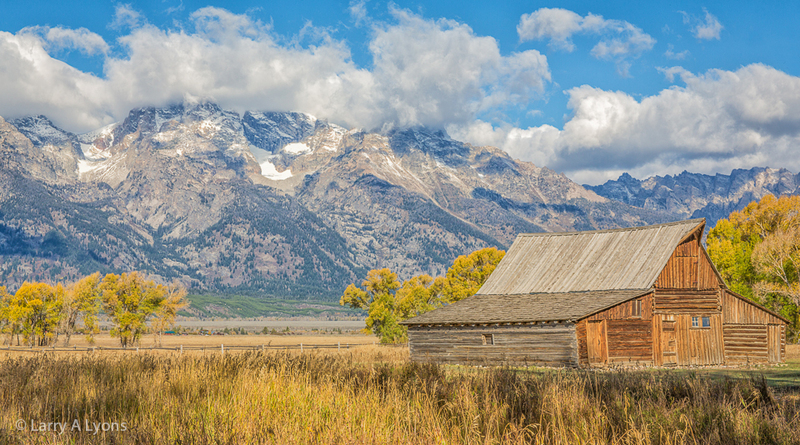 Homesteads settled by few frontiersmen in Jackson Hole Valley during the 1890’s and early 1900’s have been historically preserved. One particular homestead, known as the “Shane Cabins”, was actually used as props for a 1953 movie starring Alan Ladd in the movie entitled “Shane”. It is an American West movie about homesteaders. 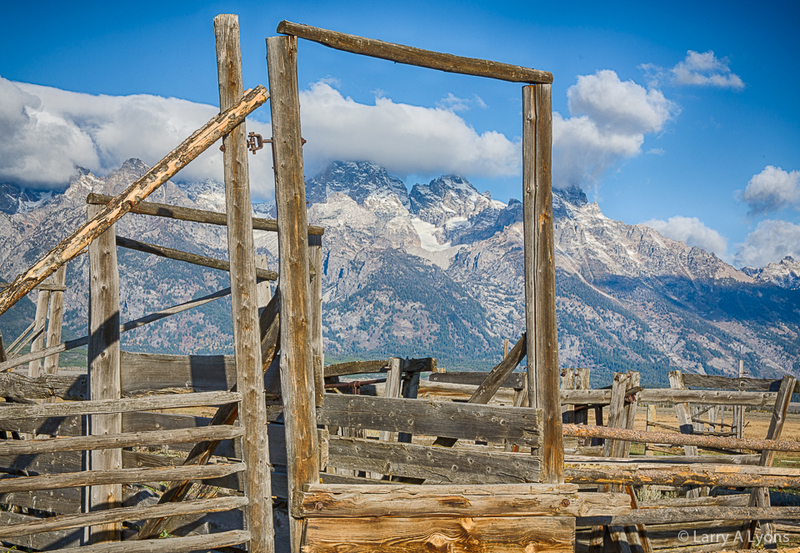 A clip of this movie with the Grand Tetons as the setting can be found at Shane. Historically this homestead was the “Luther Taylor Homestead” that was built in 1916; however, for the most part it is referred to as the “Shane” cabins. 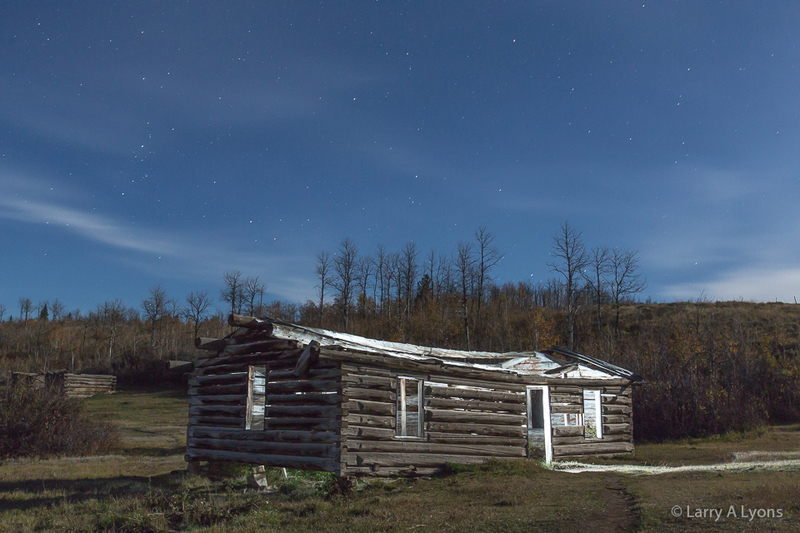 While photographing these nighttime images, the howling of coyotes in the distance added to the lore of the Shane cabins. 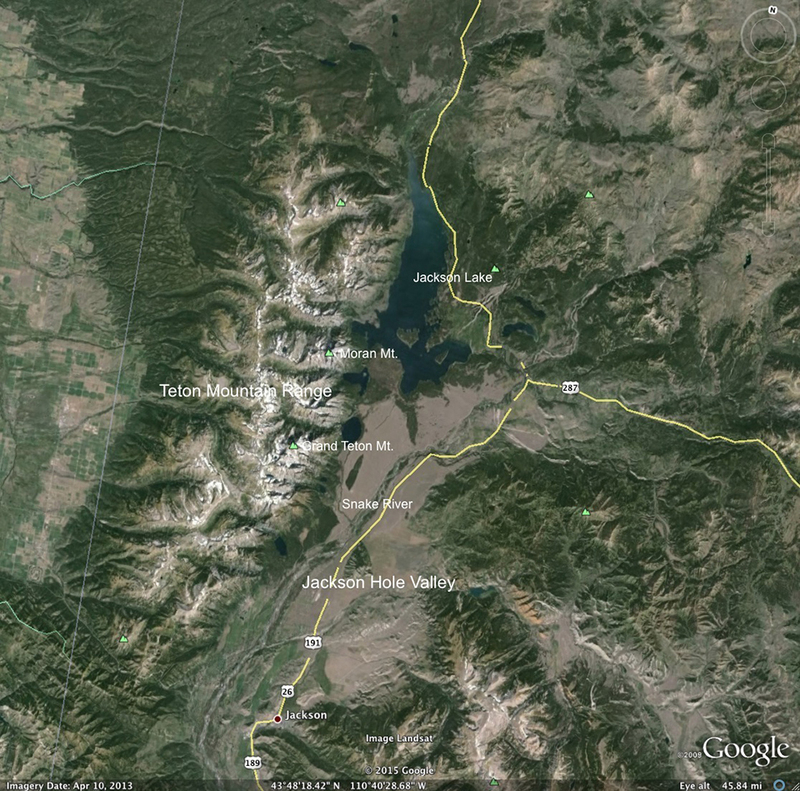 There is also a complex of homesteads within Jackson Hole Valley referred to as ‘Mormon Row’. 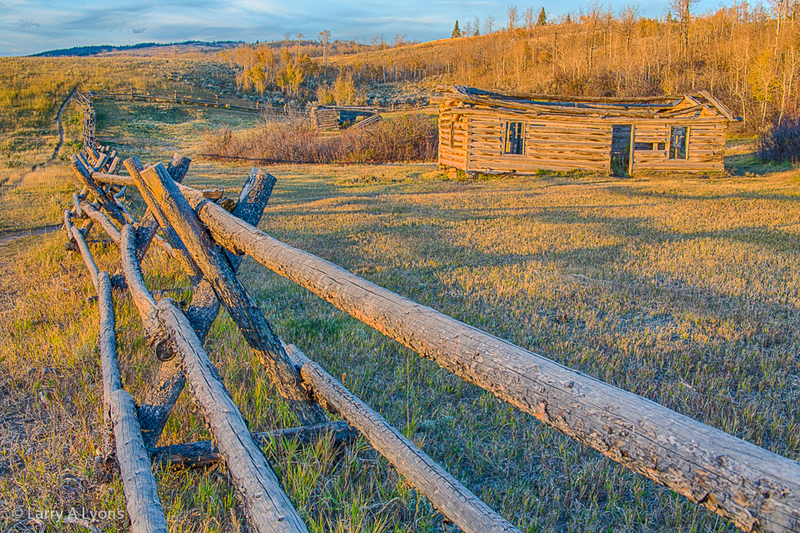 Mormon homesteaders began to arrive in the 1890’s. These homesteaders clustered their farms to share labor and community. 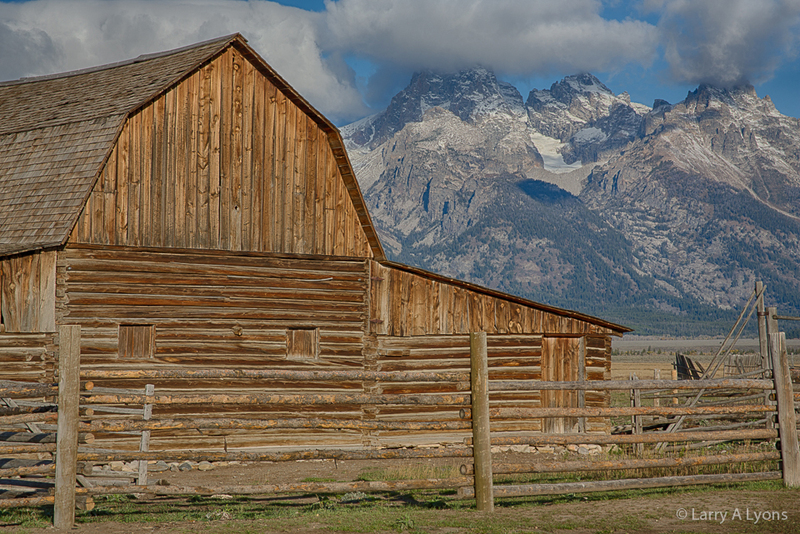 Despite the arid and long winter conditions of the Jackson Hole Valley, these settlers grew crops by using irrigation. They dug out levees, dikes and ditches to funnel water to their fields. Today the barns of two settlers – John and Thomas Moulton- remain as historic testament to these hardy homesteaders. Bid adieu to the Tetons for now. 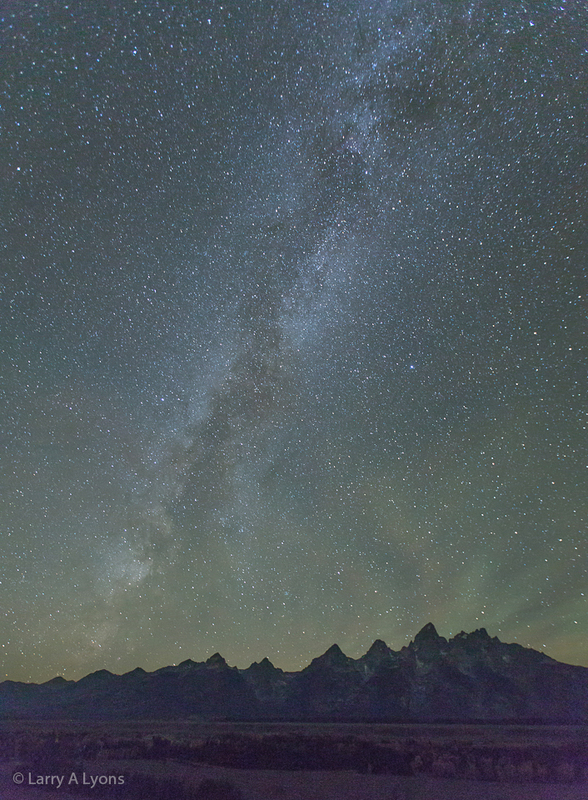 As majestic and grand as the Tetons stand here on planet Earth, you can only ponder when glazing into the Milky Way and its millions of stars the infinite wonders of this universe. Stay tuned for upcoming posts. One upcoming post will provide a glimpse of the wildlife utilizing both the Grand Teton and Yellowstone National Parks. Another post provide a glimpse of Mammoth Springs, which consists of extensive limestone formations generated by the hot springs in Yellowstone. In addition, a ‘glimpse’ into other National Parks, including the Badlands, the Redwood Forests, Yosemite, Death Valley, and the Grand Canyon, will be forthcoming. Wow! you did an outstanding job once again. Hi Larry, hate to tell you, this but all the pictures are blurry. Oh, never mind, I just found my glasses:) Susanne and I are enjoying your posts which help bring back great memories of these parks. Great job with both the photography and the narrative. Thanks so much for sharing your experiences and talent in capturing them! Say “hi” to Coley for us! More great work, Larry. Almost too much to take in in one post. I thought “The Tetons” panorama and “Mt. Moran at Oxbow Road” were outstanding. Truly wonderful reminder of this land of ours- We Americans are so blessed to live in such majestic country. Awesome Can’t wait to see more. I love the narration along with the images. Going to Alpine Wy. in August so thank you for all the wonderful references. I can only hope to get a few shots as glorious as your entire album posted here. I kept thinking, this is my absolute favorite, and then I scrolled down, and thought, no this is my absolute favorite picture. All so great – I really can’t choose which is the best! Gorgeous beyond belief! What a wonderful adventure and productive too! You’ve done a fantastic job with your imagery and information. Can’t wait to see more!! !